It’s that time again—time to build yet another exam. There might be only a midterm and final in your course, but exam creation always seems to be in progress. Therefore, creating a process and workflow that establish clear expectations and roles for all faculty is vital to implementing exams successfully. This is especially true in courses that include multiple teaching faculty contributing to the composition of the exam. Through the use of exam blueprinting, creating a workflow for faculty to guide exam construction improves communication, efficiency, and ultimately the effectiveness of our assessments. So, what exactly is an exam blueprint? Blueprinting is the process of leveraging ExamSoft category mapping into an exam guide. Users can set the exact number of questions required from specific categories (any type of objective you would like to measure) to be included on each exam. Thus, as exam creators, we have the ability to be strategic about the composition of our exams. As with any tasks related to student success, it is key to set goals for your assessments. From expected student outcomes to content to logistics, each exam should be made with a purpose. Therefore, using a computer-based assessment tool to guide the blueprinting process is crucial. Creating an exam blueprint is the very definition of building an exam with a purpose. A blueprint provides faculty the opportunity to be intentional with the content and difficulty level of each and every exam. Historically, exam creation has been a logistical exercise, which is a disservice to our students as we prepare them for the next ventures in their academic and/or professional careers. The number of questions from each content discipline shouldn’t be determined by contact hours; this should be a calculated process based on student needs. For example, if you are preparing students for a licensure exam, the contents of your exams should closely match those of the very licensure exams for which you’re preparing them. Exam blueprinting also enables course coordinators to create exams at the appropriate difficulty levels with respect to students’ abilities and the learning objectives they’re expected to achieve. This will allow for the creation of more deliberate exams that will deliver the results you expect while appropriately challenging students. By categorizing exam items to difficulty levels (such as Bloom’s taxonomy) in the blueprinting process, you’re provided with the communicative tool needed to ensure all exams are well balanced, fair, and reliable. It’s important to distribute each exam blueprint as early as possible to your course faculty so they can appropriately teach content to students. Additionally, writing exam questions is a difficult task—providing faculty with as much guidance as possible in this process will help them write exam items that play a part in the creation of a well-balanced exam. I often tell faculty to be clear, concise, and transparent when introducing new instructional methods to students. This same thought process is applicable when driving faculty workflow on exam building—clearly describe to faculty the goals of the exam while using exam blueprints to be transparent with what is expected of all faculty. This is key. To properly use blueprinting, exam items must be mapped to categories. Having items mapped as they are entered into your assessment software will streamline the process of building exams. I recommend creating your category structure in advance of the start of your course(s) and then mapping exam items according to these categories. This is truly the catalyst of this process being a communicative tool for course faculty. Setting the standard for which categories will be included in assessments will allow faculty to ensure these content areas are covered in their teaching. When exam time comes around, they will simply be able to add the items from the categories that were created pre-semester to fulfill the exam blueprint. If you’ve already used exam items on previous exams, this will allow you to be even more strategic about your exams! Look at the performance statistics to identify which items will best accomplish your goals on current exams based on their previous performance. Determining which items to include on exams based on item performance data will make achieving assessment goals even more attainable. This might be the easiest step of the whole process—now that the categories in your blueprint have been set and the expectations have been distributed to faculty, it’s time to add questions to your exam to complete the blueprint requirements. This process is as simple as opening the assessment, finding the category in the blueprint that correlates with your questions, and adding items to fulfill the requirement. As the course or exam coordinator, the exam-building progress can be followed in real time. Gone are the days of asking for more questions from an exam based on contact hours or needing more questions on a specific subject. Now the requirements for the exam are in plain sight for all faculty to see. 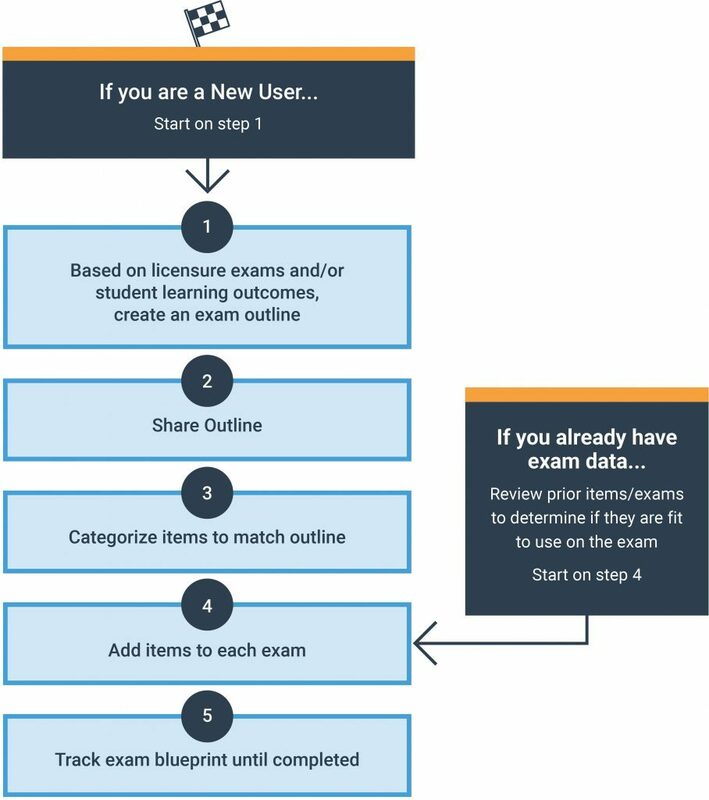 Having this workflow established in advance will also allow faculty to communicate better when they have exam questions that address similar content. By improving expectations, workflow, and communication, our exams will avoid redundancy and the sometimes conflicting information included on exams that can be quite confusing for our students. At this point, all that’s left to do is distribute your exam to students. 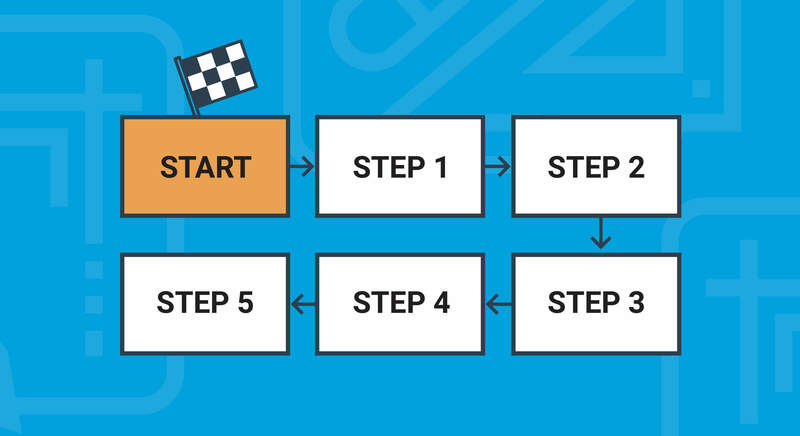 Through the simple task of creating a blueprint of the content required on your exams, you’ve created a workflow that guides faculty through the exam-creation process. Not only will this process guide workflow and help manage faculty expectations, but it also will improve communication by more clearly defining faculty roles and expectations when building exams as a group. The combination of creating assessment goals, defining exam content requirements, and improving faculty communication will lead to exams that reach their maximum potential by being fair, reliable, and appropriately challenging for students.